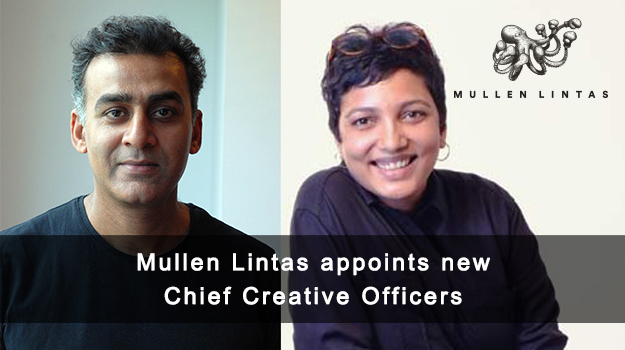 Mullen Lintas has recently announced the new creative leadership at the agency. Azazul Haque (previously Chief Creative Officer, Ogilvy South) and Garima Khandelwal (previously Executive Creative Director, Mullen Lintas) are the new Chief Creative Officers. The announcement closely follows Vikas Mehta’s appointment as the agency’s Chief Executive Officer – hinting fundamental changes at the leadership level. With Azazul Haque and Garima Khandelwal onboard, the move is expected to bring double-barrel creative firepower to the agency. The duo will be responsible to produce an unfair share of attention for clients of Mullen Lintas by driving the creative vision of this ‘challenger-mindset’ led agency. Azazul Haque started his career with Lowe Lintas (then Lowe Lintas + Partners) back in 2001. Over the years that followed, he has worked with Bates, Publicis, Mudra, McCann, Contract and Ogilvy on well-known brands like Nescafe, Coca Cola, Nestle Maggi, Domino’s Pizza, Dabur, Maruti Suzuki, Havells, Amazon, Titan and Motorola, ICICI Bank, Bajaj Auto and Rajasthan Tourism, among others. His work for Havells (Shock laga), Domino’s (Pahli kamayi + Yeh hai rishton ka time), Rajasthan Tourism (Jaane kya dikh jaaye), Amazon (Mom be a girl again + Chonkpur Cheetahs) and Titan Raga (Mom to be) are memorable and widely appreciated. His work has been consistently recognized and rewarded at domestic and international award shows like Cannes Lion, D&AD Pencil, India and APAC Effie, Kyoorius, WARC et al. In 2018, he was awarded South Asia Creative Person of the Year (Runners Up) by a popular magazine. Garima Khandelwal kicked-off her career in advertising with Ogilvy Delhi approximately 18 years ago. She moved to Mullen Lintas in 2015, and her former role as Executive Creative Director gave her an opportunity to influence the creative direction for some of India’s most celebrated brands. As the founding member of Team Mullen Lintas, she is responsible for the agency’s marquee work such as – Motilal Oswal (Equity experts), Tata Tea (Alarm bajne se pehle Jaago Re), MTV Beats, Bajaj Avenger and Too Yumm (National launch). Before moving to Mullen Lintas, she worked with Lowe Lintas where she lent her creative expertise to a diverse set of clients across categories. Some of the clients that she has been associated with include Suzlon PALS, Tata Tea (Kala Teeka), Axe (Boat Party), Liva, etc. She has also worked for Leagas Delaney, on the Skoda account for the European market, based out of Prague. Both Garima and Azaz will be based out of the agency’s Mumbai office.